Everyone likes value for money. Whether it’s an effort to get the most spacious car at the lowest price, or to save money on road tax and insurance, most people want to know what represents a good buy. With our ‘Data Bank’ features we’ll be revealing top ten models in various criteria, whether it be insurance groups, interior space, or road tax bands, performance or dimensions. For this first instalment we’re going for the criteria almost everyone is considering lately – emissions. So if you’re after free road tax, congestion charge exemption, and a bargain price, here’s a low-down of the cheapest sub-100g/km cars. This list was compiled from our prices and specs data, which is listed in the car-by-car entry for each model. It might be in last place on the list but it’s still decent value for money. The Fiesta Econetic produces 95g/km of CO2 and its 1.6-litre diesel engine is capable of 76.3mpg on the combined cycle. And, of course, it’s congestion charge exempt and has free VED. While it might be the most expensive car on this list it produces one of the highest torque figures - a hefty 203Nm. 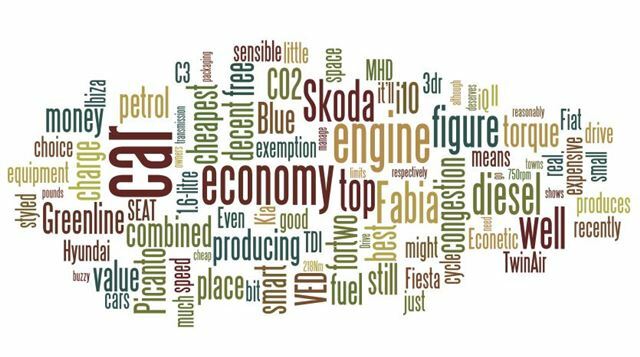 Ninth place goes to the Skoda Fabia Greenline II, which also has the accolade of producing the least CO2 of any car in this top ten at 89g/km, and the best combined cycle economy figure of 83.1mpg. Our real life fuel economy register shows that real owners don’t manage such an impressive figure from their own cars, but nonetheless the real life average figure is a respectable 62.8mpg, so it’s pretty efficient. The 1.2 TDI engine fitted to the Ibiza is the same as in the Fabia Greenline, but it doesn’t quite match the Skoda on economy or CO2, scoring 80.7mpg and 92g/km, respectively. If you push it to its limits, though, it’ll beat the Fabia on top speed... by 1mph. More important, however, is the SEAT's price. It's cheaper than the Skoda by a few hundred pounds. Falling just below 100g/km, the C3 1.4 HDi is the cheapest five-door diesel in the list, but besides that it doesn’t excel in any area. Even so it’s reasonable value for money, and it’s certainly a well styled car, so a sensible choice for those interested in a bit of Gallic charm. The cheapest diesel car in the list deserves merit for also producing the most torque, its 1.6-litre diesel providing 218Nm from 1,750rpm. So if want a good diesel all-rounder that works on the motorway as well as it does in towns and on country lanes, this is the cheapest way to go while still benefitting from free VED and congestion charge exemption. The most expensive petrol in the list, but perhaps also the most desirable, the Fiat 500 TwinAir manages to produce more power and torque than any other petrol engine car listed despite having only two-cylinders. It’s also great fun to drive, but if you enjoy yourself too much then you won’t come close to the claimed economy figure of 68.9mpg. Sensible packaging means the iQ is ideal city transport, with space for three adults in a car only 29cm longer than a two-seat smart fortwo. With a top speed of 93mph it’ll work out of town, but because if its short length, buzzy little engine and small cargo capacity it’s best suited to inner-city drivers. Despite being badged as a micro-hybrid drive (mhd), the Smart isn't actually a hybrid - it merely has an egine stop/start system fitted. Confusing we know. The engine is a 1.0-litre three-cylinder petrol unit with 71bhp and fitted with a five-speed semi-automatic gearbox called 'softip'. Performance is fairly leisurely but the Smart is economical with a claimed average of 67.3mpg - identical to the Picanto and i10. It's ideal for busy city driving plus of course you can still park it nose into the kerb while everyone else has to parallel park. Until recently the Hyundai i10 Blue would have ranked at the top of this list. Despite being knocked down to second place it’s still a sensible car. It’s got space for five, comes with decent standard equipment including air-conditioning and USB-in, and can return good fuel economy without much effort from the driver. The recently launched Picanto, even in its most basic form, benefits from free VED and congestion charge exemption. It’s also sharply styled, well put together, good to drive, and reasonably well equipped, although you’ll need to spend a little bit of money to get the same level of equipment as in the i10 Blue. Even so, for less than £8000, the Kia Picanto represents tremendous value for money. For detailed information on any of the cars on the site you can check the specs section.